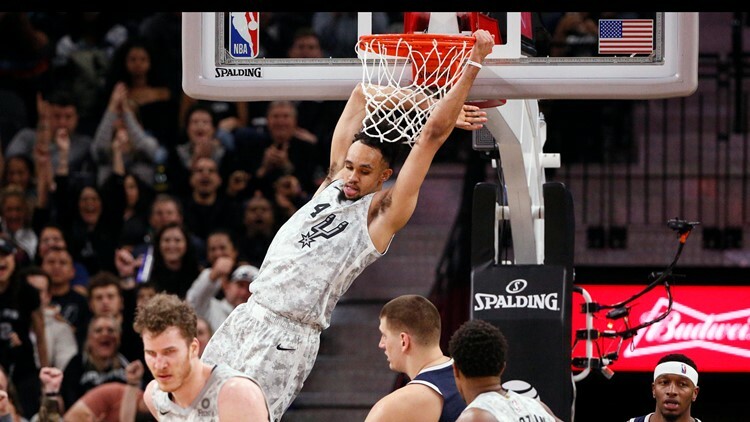 San Antonio Spurs point guard Derrick White (4) dunks the ball over Denver Nuggets center Nikola Jokic (right) during the second half at AT&T Center. SAN ANTONIO - DeMar DeRozan had 30 points, LaMarcus Aldridge scored 27 and the San Antonio Spurs beat the Denver Nuggets 111-103 on Wednesday night. Nuggets: Will Barton (right hip), Paul Millsap (broken right toe), Isaiah Thomas (right hip surgery), Gary Harris (right hip), Michael Porter Jr. (lower back surgery) and Jarred Vanderbilt (right foot surgery) all missed the game due to injury. . The Nuggets' last win in San Antonio came on March 4, 2012. Denver is 19-74 in San Antonio, but holds a winning record over the Spurs at home (48-43). . All but one of Denver's losses this season has come in consecutive games. The Nuggets have a four-game losing streak and three two-game skids. Spurs: San Antonio rookie guard Lonnie Walker IV was active for the first time this season after injuring his right knee during the preseason, but did not play. Walker missed the first 20 games and spent the past 14 assigned to the team's G League affiliate. . Aldridge failed to hit the rim on his only 3-point attempt. . DeRozan rolled his ankle late in the first half but quickly got up and remained in the game following a timeout.